With the rapid change of technology - it's difficult for marketers and business owners to stay up to date with effective marketing tactics. Often leading to confusion, and paralysis. 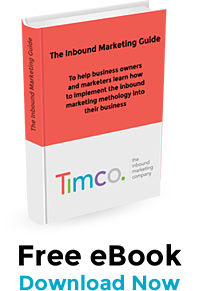 The purpose of this Inbound Marketing Guide - is to help business owners and marketers learn how to implement an effective marketing methodology into their marketing process. And to educate you on content marketing strategies that will help your prospects find you, convert prospects into qualified leads and customers, and analyze your results to improve marketing ROI. Annual research across a wide range of industries and business types consistently supports that inbound marketing generates qualified leads, with the cost per lead 61% lower than that of traditional tactics. In fact, inbound marketing is more than just a methodology, its a philosophy that needs to be adopted by all team members. Inbound marketing is growing in adoption because those who implement it are seeing real results from their efforts. This inbound marketing guide is the start to understanding inbound marketing, and provides an easy to understand step by step guide to implementing it into your marketing process. Discover how to build your brand and reputation with valuable and relevant content marketing. Understand the process to creating a strategic marketing action plan. Identify what content will help with lead generation. Know what lead conversion tactics you need to implement. Learn what tools and software you need to manage your marketing and track results.